The shipping industry is facing unprecedented change. With topics such as new environmental regulations and the opportunities and challenges of digitalisation dominating the conversation, seafarers' welfare has tended to be overlooked. This trend is slowly changing as the industry continues to recognize the need to professionalize its approach to maritime welfare, but there is a long way to go. True, that there are model owners and operators within the industry who uphold the highest standards of welfare for their crew, but there is still plenty of work to be done to ensure uniformly high standards across the board. At least for the foreseeable future, seafaring will continue to be a physically and mentally demanding occupation in a dangerous environment. And without the dedication, commitment, and professionalism of seafarers, the whole fabric of global trade as we know it would fall apart. This year, The International Maritime Organization (IMO) marked its annual Day of the Seafarer by highlighting the need for the industry to focus on the wellbeing of seafarers, particularly their mental health. With stricter security controls in ports, endless inspections, and minimal opportunities for shore leave, it's no wonder that there is increasing awareness of the stresses and strains placed on seafarers and concerns for their mental, as well as physical wellbeing. 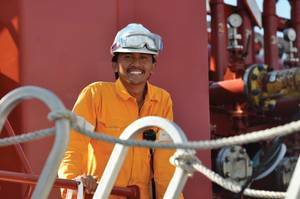 For maritime professionals engaging with seafarers, it's imperative to understand and appreciate the various issues affecting seafarers that can and do have an impact on their overall wellbeing. One of the key issues highlighted and well publicized is fatigue, resulting from seafarers being expected to take on heavier workloads with less support, and to work longer hours with less time off - on board or on shore - to recuperate. There are several dangers to this, most notably seafarers inadvertently placing themselves and their crew in immediate danger due to loss in concentration or perceived pressure to complete tasks quickly by taking shortcuts. Clearly, we need to think not just about the physical health of seafarers, but also their mental health. This includes ensuring that they feel supported and encouraged to exercise and eat healthy, balanced meals - and this requires having access to healthy meals in the first place - as well as general health promotion. Ultimately, seafarers must feel empowered to have the necessary skills and knowledge to apply strategies to cope with day-to-day stresses they encounter. In addition, those working with seafarers, particularly those visiting ships, also need to understand their needs. The reality is that seafarers exist in a complex legal environment where multiple jurisdictions of flags, ports, and their home countries sometimes fail to provide the protections enjoyed by citizens working ashore. As the industry continues to pay closer attention to the overall wellbeing of seafarers, it is worth noting that dealing with seafarer wellbeing requires a comprehensive and holistic approach that takes into consideration the roles and responsibilities of all stakeholders. Seafarers remain heavily reliant on a vast network of shore-based counterparts when it comes to many aspects of their working lives; from ship owners to ship managers, flag state inspectors to port authorities and ship agents. Their decisions have a major impact on the conditions and wellbeing of seafarers, for better or worse. They are also supported by the extensive community of people providing maritime welfare services. Many of these individuals share a genuine commitment to the cause of maritime welfare. Indeed, for some, it is a vocation to which they have dedicated their careers and lives. Maritime welfare touches on and is impacted by a wide range of issues, from the legal framework to an understanding of occupational health issues, including the physical, psychological, and social aspects of working at sea. Equally, the discipline of crew management today brings in a range of important considerations, including the evolving threats to safety and security, both in port and at sea. Although training has historically been available in different aspects of maritime welfare, there has not yet been a training programme that addresses all aspects, giving participants an all-encompassing 360-degree perspective on maritime welfare. However, this recently changed with the launch of MARI-WEL - the Professional Development Program in Maritime Welfare. Created through collaboration between the ITF Seafarers' Trust and the World Maritime University (WMU), MARI-WEL is a new training programme specifically designed to provide the skills and knowledge needed to support seafarer welfare. It is the first program of its kind to deliver a comprehensive and innovative distance learning course on topics that relate to maritime welfare. From the latest developments in IMO codes and conventions to the role and ethics of social intervention, the course covers all the bases. The course is delivered by top experts in their field and is accredited by the WMU. In terms of a professional approach to maritime welfare training, we believe MARI-WEL is set to become the gold standard. All employers with seafarer-facing personnel have a responsibility to equip their people with the knowledge and skills to do their jobs properly and professionally, which means understanding the welfare implications of the decisions that they take. We understand the pressures facing the shipping industry, ranging from the pressure of environmental regulations to the drive towards digitalisation, but the human factor must not be overlooked. We must continue to collectively demand accountability on all issues relating to seafarer welfare. And crucially, we must continue to promote best practice and establish a professional standard in maritime welfare that can be upheld across our industry. The MARI-WEL program opened its virtual doors on 1 August and we hope to see widespread take-up of the course. To sign up, visit http://mariwel.wmu.se. The partners that produced this first groundbreaking study: World Maritime University, Marine Learning Systems and New Wave Media, will announce plans for the 2019 survey shortly.